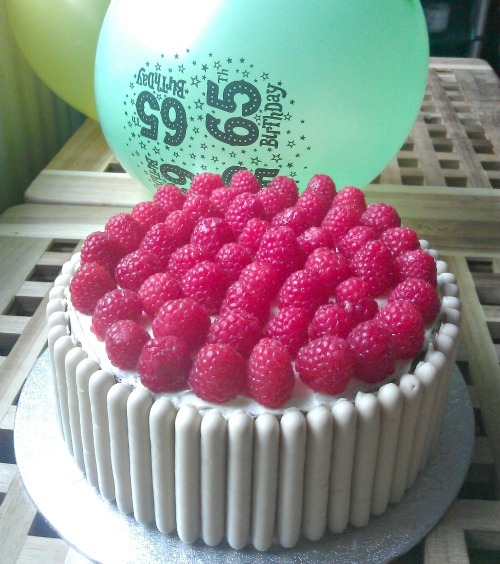 Monday was my mum's birthday and such an amazing mum deserves an amazing birthday cake. 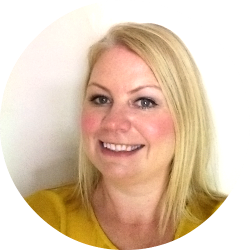 Last week I asked her what cake she would like and she said a lemon drizzle cake. However I forgot to buy the lemons! Whoops! 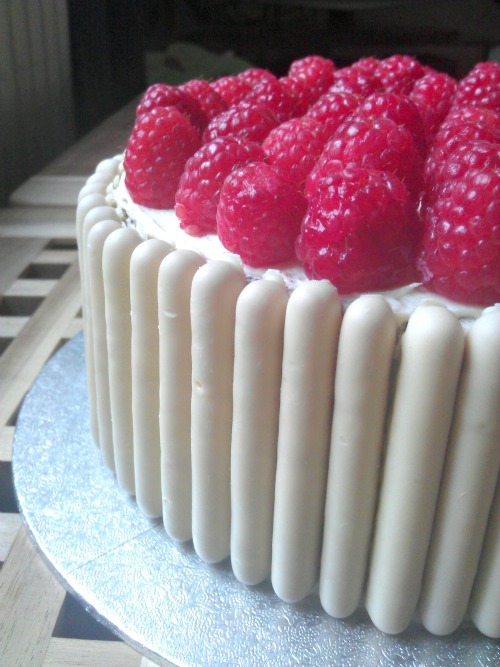 So instead I made this, which is a Victoria sponge cake wrapped up with white chocolate fingers and topped with plump, juicy raspberries. 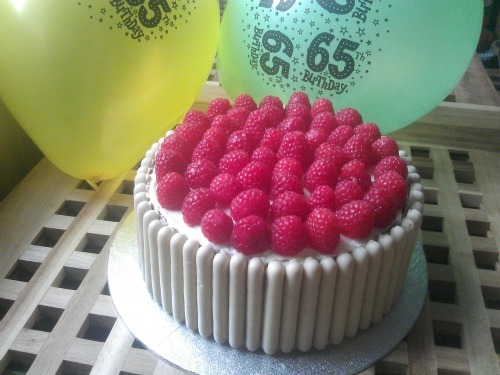 Luckily my mum adores raspberries. The great thing about this cake is that visually it has the wow factor which is obviously great trait for a birthday cake. Plus it also tastes divine. I had a huge slice at my mum's birthday tea and I couldn't help letting out a big 'mmmmmmmm'! Bake the victoria sponge cakes as per the recipe above. Leave them to cool completely on a wire rack. To make the filling, pour the cream into a large bowl and beat with an electric mixer until it forms stiff peaks. Put one cake onto a serving plate/board and spread with the cream, making sure you go right to the edges. Then spread the jam on to the other cake. Carefully sandwich the cakes together. If the top cake is domed, you can slice the dome off the level it. For the buttercream, put the softened butter into a large bowl and sift in the icing sugar. Mix together by hand with a whisk until well combined and there are no lumps. Add the milk and vanilla extract and mix with a spatula until combined. Now mix with a hand held electric whisk for about 5 minutes on high speed until it's light and fluffy. Spread the buttercream around the sides and top of the cake. There should be enough to give the whole cake a good thick covering. 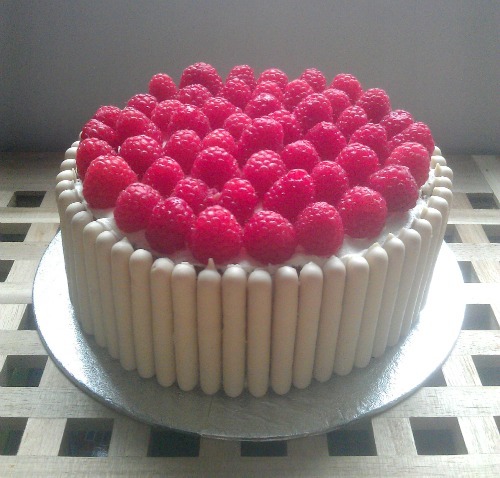 Lastly, stick the chocolate fingers all the way round the cake and arrange the raspberries on top. If you want a bit of extra wow factor you could sprinkle on a little edible glitter too. ooh, so neat & pretty!